In April 2002 Jake Walters photographed Alice Coltrane at her home in Santa Barbara for the cover of The Wire 218. One of the extended family members hanging out at the shoot was Alice's teenage nephew, Steven Ellison. 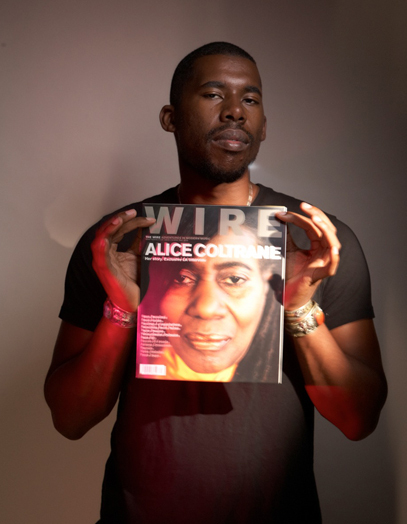 Ten years on, and Ellison is now better known as Flying Lotus, patron saint of downtempo beat makers, and now Jake has photographed him for the cover of the forthcoming October 2012 issue of the magazine. So we couldn't resist a pose with a copy of that issue graced by the numinous presence of his late, great Aunty Alice, and here it is. The October issue, complete with more images from Jake’s shoot, will be on sale from next week and on its way to subscribers from the end of this week. The digital edition will be dropping in from the ether on Tuesday.